UPDATED: Mon., Feb. 4, 2019, 10:16 p.m.
Northern Arizona actively tried to keep Jacob Davison from breaking the 40-point barrier. 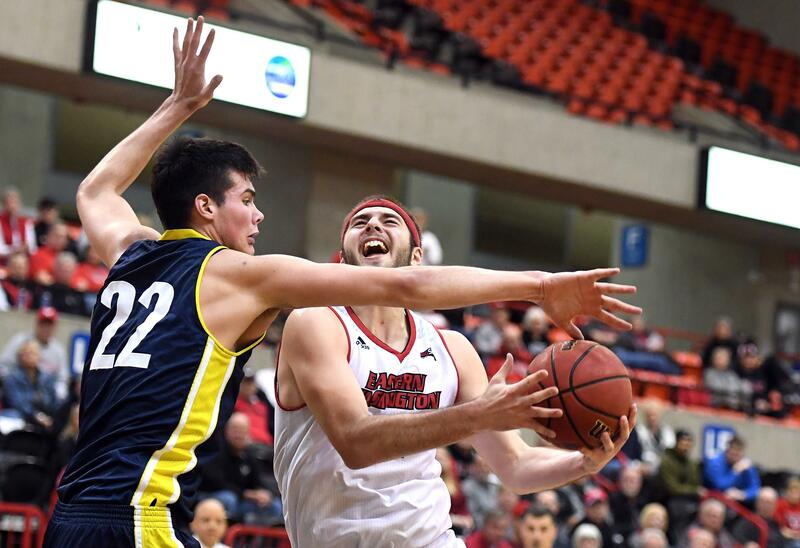 The game was all but decided, but Eastern Washington’s talented guard met a host of defenders in the closing seconds, weaved his way through each and created enough space to get off a final shot. It kissed in off the glass, giving Davison a career-high 41 points Monday night, seventh-most in school history, in the Eagles’ 82-64 win at Reese Court. It was EWU’s fifth victory in six contests. Davison scored 14 of the Eagles’ first 16 points and continued his torrid pace, hitting five of his seven 3-pointers in the first half. EWU (8-13, 6-4 Big Sky) never trailed. Jesse Hunt (15 points, 11 rebounds, six assists) had his seventh double-double of the season and freshman big man Tanner Groves, filling for injured forward Mason Peatling, had his first career double-double (13 points, 11 rebounds, four blocks). Groves, a Shadle Park graduate, was one of two Spokane products to crack the Eagles’ starting lineup, along with guard Cody Benzel (Ferris). EWU’s electric point guard Tyler Kidd was a chilly 2 for 10 from the field, but he dished out a game-high nine assists and made three steals. The Eagles, who enter the second half of Big Sky Conference play in fourth place, led NAU (7-14, 5-6) by double digits for most of the game. With Peatling, EWU’s primary inside threat, nursing an ankle sprain, the Eagles lived up to their team’s marketing slogan: Let it fly. EWU hit 12 of its 34 attempts from 3-point range, nearly the same mark as Northern Arizona (12 for 33). The teams combined for 18 3-pointers in the first half. A 3-pointer by NAU’s Ted McCree cut EWU’s lead to 28-24 late in the first half, but the Eagles went on a 15-4 run and the Lumberjacks wouldn’t get any closer. NAU, which was held to 33 percent from the field, was led by Bernie Andre (13 points, nine rebounds) and Luke Avdalovic (13 points). Published: Feb. 4, 2019, 9:42 p.m. Updated: Feb. 4, 2019, 10:16 p.m.